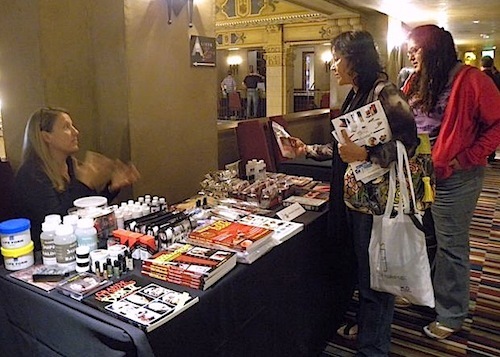 During the Aliens To Zombies Convention last weekend, one of the vendors was Alcone, a company that supplies makeup and special fx products to individuals and professionals makeup artist around the world. I stopped at their table and was delighted to find that their 3rd Degree product is now available in a pourable liquid formula. That’s right kids, the 3rd Degree that you know and love now comes in a liquid! It’s so new, that I didn’t even see it on their website. 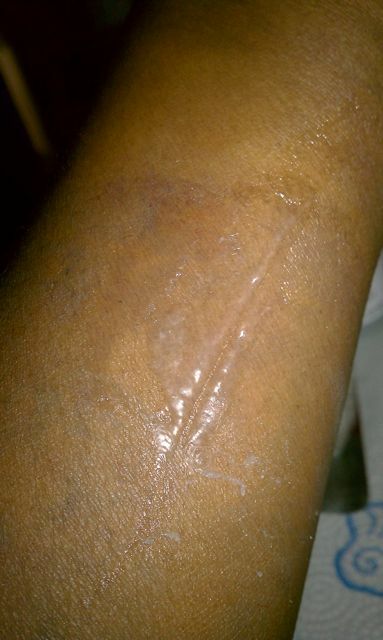 The original 3rd Degree product is a thick, two-part (part A & part B), medical grade, silicone gel. When you mix equal parts of A & B together you can sculpt it into any shape. 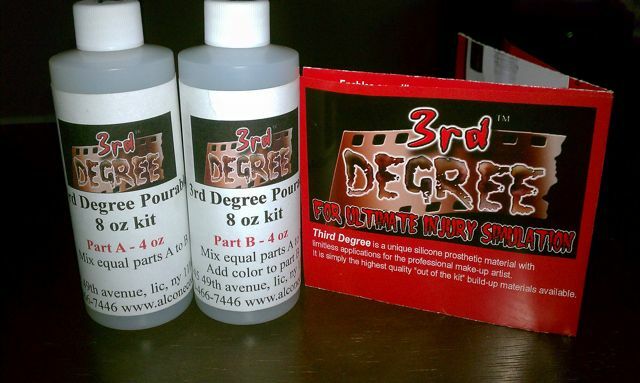 I talked about the gel based 3rd Degree on Day 15 of the 31 Days of Halloween Makeup series. Both the gel and liquid 3rd Degree have the same properties except for the consistency. The pourable version is the consistency of honey. As with other 3rd Degree products, you can make the edges of your piece virtually undetectable…. unless you get distracted by your dog. Actually, I could have added more product to fix the edges. Great for creating super thin, small prosthetics. Use 3rd Degree for build ups by incorporating different materials like embedding tissue or gauze. Even googly eyes, or pieces of grapes can help create blisters and boils. 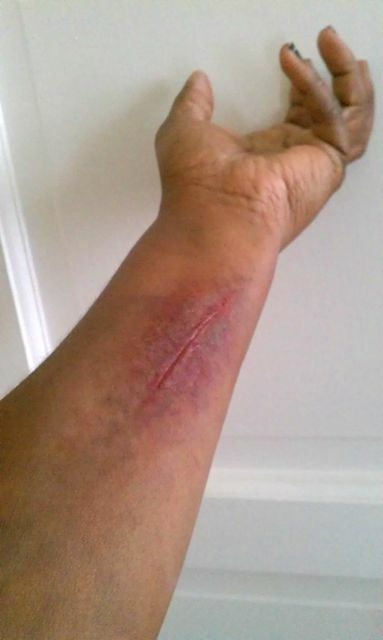 I painted the cut with Skin Illustrator and added trauma to the area around the wound. You can intrinsically color 3rd Degree with just about anything. Add coloring to part B and then mix part A & part B together. A little color goes a long way, don’t over do it on the color, you want to keep that translucent “skin” look. So far I am really loving the 3rd Degree Pourable version. I will continue testing the product and may even do a video or two. I believe this will make a nice addition to my on-set kit for doing quick effects. In the mean time, I am going to use it to create some wounds for a gruesome Halloween look. ← 31 Days of Halloween Makeup – Day 23: Aliens & Zombies & Werewolves, Oh My!